We’d love your help. Let us know what’s wrong with this preview of Song by Michelle Jana Chan. Opening in the mid-nineteenth-century, this dazzling debut novel traces the voyage of Song, a boy who leaves his impoverished family in rural China to seek his fortune. 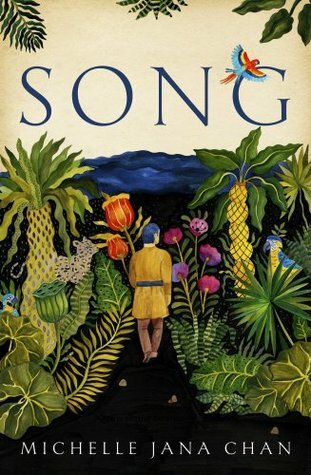 Song may have survived the perilous journey to the colony of British Guiana in the Caribbean, but once there he discovers riches are hard to come by, as he finds himself working as an indentured plantation Opening in the mid-nineteenth-century, this dazzling debut novel traces the voyage of Song, a boy who leaves his impoverished family in rural China to seek his fortune. Song may have survived the perilous journey to the colony of British Guiana in the Caribbean, but once there he discovers riches are hard to come by, as he finds himself working as an indentured plantation worker. To ask other readers questions about Song, please sign up. Arriving in Guiana, nine-year old Song finds little evidence of the easy fortunes to be made that enticed him to risk his life to travel there. Instead he finds only punishing labour, harsh cruelty and an existence akin to slavery on a sugarcane plantation. By a stroke of good fortune, Song is taken under the wing of Father Holmes who teaches him to read and write and introduces Song to the love of books and reading. Not everyone agrees with Father Holmes’ decision to educate a ‘houseboy’ but Arriving in Guiana, nine-year old Song finds little evidence of the easy fortunes to be made that enticed him to risk his life to travel there. Instead he finds only punishing labour, harsh cruelty and an existence akin to slavery on a sugarcane plantation. By a stroke of good fortune, Song is taken under the wing of Father Holmes who teaches him to read and write and introduces Song to the love of books and reading. Not everyone agrees with Father Holmes’ decision to educate a ‘houseboy’ but Father Holmes robustly defends his actions. “Reading changes everything. Writing will give him a step up. Whatever Song chooses to do in life he’ll do it better with a pen or book in his hand.” (Who could disagree with that?) Together Song and Father Holmes form a close bond, sharing a mutual interest in documenting the native birds of Guiana. A trip ‘upriver’ with Father Holmes gives Song a possible new direction in life. However, it’s one that is not without danger. When a shocking act of betrayal and violence occurs, it results in a desperate act that will haunt Song for years afterwards. It also illustrates the lure of gold which, like a fever, infects the so-called ‘pork-knockers’ who set out to make their fortunes. As Song sets out to achieve the life objectives he has set himself, he faces discrimination and injustice. This reader certainly gave a little cheer as Song begins to fight back against the forces of the “old boys’ network” he finds ranged against him. However, along the way, he is forced to make difficult and at times questionable moral choices. Song is clever, resourceful and mindful of the advice he receives from the influential figures in his life: Father Holmes (a wonderful warm and humane character); his shipmate on the terrible voyage to Guiana, Li Bai; and mining engineer, Mr Leigh. He also benefits from the wisdom of several women – Jingy, Josie, Amalia – with their ability to read a situation. A repeated theme of the book is the importance of living a life that is ‘a story worth telling’. Song’s life is definitely a story worth telling. Song is a wonderful tale of survival, friendship, courage and triumph over adversity. It also has at its heart a tender and heart-warming love story. Michelle, you had me in tears at the end. Song is a young Chinese boy who is forced to leave his country in the hopes of being able to to send money back to his family after his father and most of the men in the village are killed in a flood. This is a story of survival and courage that not many in his situation would have been able to survive. Song is a memorable character for his bravery spirit and never giving up on his dreams. Thank you Netgalley and Unbound for a copy in exchange for an honest review. Firstly I have to say how much I love that cover, the bold colours and unusual picture really works. I know you shouldn’t judge a book by its cover but I think there is no denying that a great cover definetly helps. This was a surprising emotional read for me. The hardships that Songs family endure at the start of the novel was just heartbreaking and I have no idea how I’d cope in a similar situation. The strength and resilience the children show in this situation made me cry and i just wanted to Firstly I have to say how much I love that cover, the bold colours and unusual picture really works. I know you shouldn’t judge a book by its cover but I think there is no denying that a great cover definetly helps. This was a surprising emotional read for me. The hardships that Songs family endure at the start of the novel was just heartbreaking and I have no idea how I’d cope in a similar situation. The strength and resilience the children show in this situation made me cry and i just wanted to give them a hug. I ran upstairs to hug my kids after reading some parts of this book. Song was a character it’s hard not to fall in love with. He’s so brave setting off to try and help his family, even more so when you realise he’s only 9. All the hardships and awful things he experiences on the way was very sad and I kept hoping he’d find someone to take him under his wing. This isn’t a particularly fast moving book but what makes it is the beautiful descriptions and attention to detail that is included. The author has clearly done her research and I found it fascinating to learn more about the history of this part of the world. The reader wants to continue reading to find out what happens to Song and if he makes his fortune to help his family. The story is ultimately uplifting and it was wonderful to see how far Song had come. This is the author’s debut novel and I look forward to reading more from her in the future. I found this to be an astonishing story which showed the best, and worst, of humanity in all its' guises as we follow the story of Song who starts with nothing in life and fights to get the best kind of life he can for himself and those around him. The story starts in 1878 in a small village where life is a constant struggle and the families are dependant on the weather for the crops to feed themselves and to sell to earn money. When disaster strikes Song takes it on himself, aged 10, to venture I found this to be an astonishing story which showed the best, and worst, of humanity in all its' guises as we follow the story of Song who starts with nothing in life and fights to get the best kind of life he can for himself and those around him. The story starts in 1878 in a small village where life is a constant struggle and the families are dependant on the weather for the crops to feed themselves and to sell to earn money. When disaster strikes Song takes it on himself, aged 10, to venture further afield and see if the stories he's been told of riches elsewhere are true as he wants to provide for his mother and siblings. You find when reading this book that Song has an amazing attitude given his circumstances. He's not afraid of hard work and that is what he finds himself doing on a plantation. His first piece of good luck is crossing the path of Father Holmes, who almost becomes a father figure to Song and through his care and treatment of Song helps unleash his potential into becoming a successful young man. I loved the way the author allowed this story to flow and evolve. No matter what knockbacks Song would receive he would always seem to dust himself off and it would just make him work harder to prove others wrong, and he wasn't afraid to help others too. This story approaches the subject of racism, slavery and corruption in such a sensitive way, and also in the way that shows Song dealing with all these issues. He is aware of those doing wrong around him and isn't afraid to confront those taking advantage of others, no matter what consequences he may face for speaking up. Wonderful, beautiful, sad, uplifting, gut wrenching. Song is s I am so pleased that people pledged money to have this book published because it is a definitely a story worth telling. Set in the late 1800s, this is the story of Song - a young Chinese boy who leaves behind his family and home after the death of his father, to seek his fortune in the colonies of the British Empire, namely in Guiana. What follows is a harrowing boat trip, which is so well written, you can almost feel the claustrophobia and smell the death and faeces; his work on a sugar plantation on arrival in Guiana and his journey through decades as he seeks to overcome his past and improve his life and those Set in the late 1800s, this is the story of Song - a young Chinese boy who leaves behind his family and home after the death of his father, to seek his fortune in the colonies of the British Empire, namely in Guiana. What follows is a harrowing boat trip, which is so well written, you can almost feel the claustrophobia and smell the death and faeces; his work on a sugar plantation on arrival in Guiana and his journey through decades as he seeks to overcome his past and improve his life and those of his friends and (new) family. There were occasions where I felt the descriptions were a little lacking (I wanted to be able to smell the moist, dampness of the rainforest 'upriver') and there were a couple of instances of repetitiveness but overall this was a very worthy read and I wouldn't hesitate to recommend it. The plot (in a spoiler-free nutshell): After his father's death, 9 year old song leaves his village in China in order to find work to support his starving family. After a long and perilous journey by boat he arrives in British Guiana. Song faces horrific racism and prejudice, but has a determined spirit, and the ability to make friends in unexpected places, in a story that is both inspirational and heartbreaking. The author: Michelle Jana Chan, an accomplished travel writer - the sense of place throughout the novel makes it come alive. It's a bit like...an echo of modern day stories of migrants. You should read it if...you are a keen bird watcher. Feel free to do a shot of something each time a new species is mentioned, and have a merry old time. You shouldn't read it if...you are out of tissues. The best bit: The wonderfully crafted writing, never leaving you without a sense of hope even in the bleakest of times. Final thoughts: Few books that are entirely set in the past can resonate so much with issues of the modern day. Slavery has long been (officially) abolished but that's about the only difference between those exploited by the British Empire in the time that Song takes place and the current day. A deeply thought provoking and beautiful novel. Thank you a Unbound and Netgalley for an ARC in return for my review. This was a wonderful book, it was beautifully written and completely drew me in. This is one of my favourite books I have read this year. Set aside uninterrupted time, bring a box of tissues and a pot of tea amd be ready to be mesmerised . Song blew my mind. I LOVED this book! Such vivid historical pictures of different places in the world! Song's determination to make it and save his family is heart wrenching. I very much enjoyed this story about a young boy who leaves China by boat to journey to Guiana in search of a better life. Song begins his adventure as a naive child but soon realizes this is no fairytale. Songs character is forged by his experiences, both good and bad, to turn him into the person he becomes warts and all. I enjoyed that Song really develops before our eyes. He is not and angel nor is he jaded by his experiences to become bitter and angry. He is believable. I knew little to noth I very much enjoyed this story about a young boy who leaves China by boat to journey to Guiana in search of a better life. Song begins his adventure as a naive child but soon realizes this is no fairytale. Songs character is forged by his experiences, both good and bad, to turn him into the person he becomes warts and all. I knew little to nothing about the time period or Guiana and found this a nice introduction and wet my appetite to learn more. I would love to read a story featuring Flo as the MC. Overall, Song is a worthy read. It is no simple Horatio Alger tale, but one that is layered with themes of systematic racism, religious hypocrisy, and most importantly, love of family. This is the history of colonial times come alive. Thank you to NetGalley, Unbound, and Michelle Jana Chan for the advance copy for review. Beautiful, descriptive, authentic. Makes you connect with and root for all the characters, however fleeting their time in Song's life. I did not like the shape of the novel in the last few chapters (the themes of discrimination, family in Lishui and Song's middle-age all kept open till the end), sincerely hoping there's a sequel. This is a brilliant read, utterly gripping! Song is such a compelling character, I couldn't stop turning the pages to see what happened to him next. Devoured the whole book in a weekend. It's both haunting and inspiring, a story of survival and hope. I didn't know anything about Guiana before picking this up, but the descriptions are so vivid that I felt like I was there. Such a powerful book. I highly recommend! A vividly-rendered reminder of the perils and tragedies that come with migration - this book was so painfully beautiful, it has stayed with me.